Streets of Monroe County and some adjoining areas are listed alphabetically, presented as you would follow it if actually travelling it. Town where road starts, direction, zip code, streets branching off or crossing it, with approximate address numbers at each cross street, direction of cross streets, major identifying features such as schools listed as they occur along each street travelled. Monroe County map and Downtown Rochester map included in front of book, with many reference pages of information. 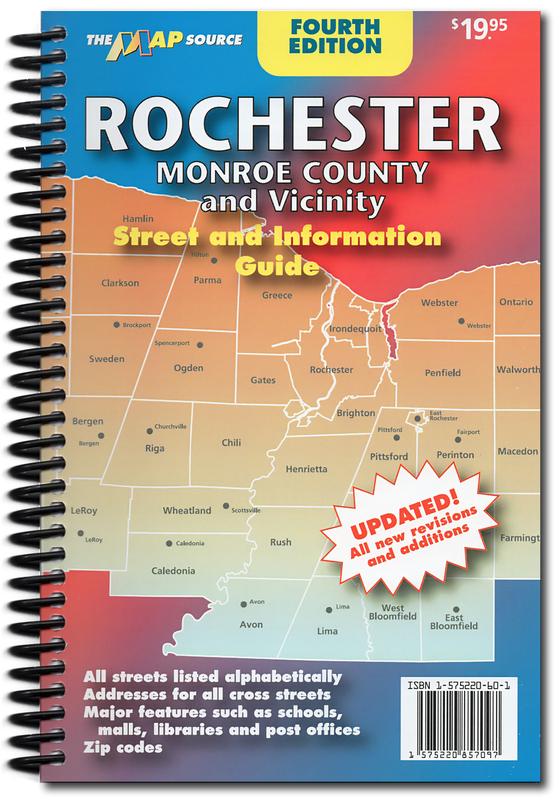 Rochester Monroe County Street Guide (book) – Streets of Monroe County and some adjoining areas are listed alphabetically, presented as you would follow it if actually travelling it. Town where road starts, direction, zip code, streets branching off or crossing it, with approximate address numbers at each cross street, direction of cross streets, major identifying features such as schools listed as they occur along each street travelled. Monroe County map and Downtown Rochester map included in front of book, with many reference pages of information. Black & white print. 229 pages. Size 5.5” x 8.5”. Fourth Edition 2012.